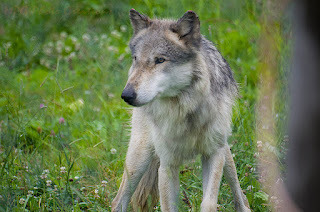 As I mentioned in an earlier post, I was able to visit a Wolf Park in Indiana with my sis-in-law and her family. It was a rainy day but we were lucky that the wolves were still up and about. This is a beautiful Grey Wolf that was up and around and not too thrilled with the rain. Looked a bit disheveled but still lovely with that great face. Very cool animals.